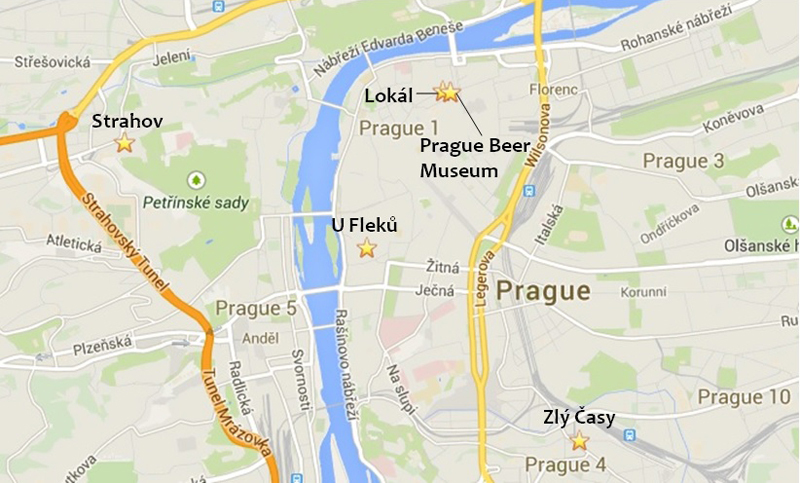 If you manage to drink beer at just these five places in Prague, you’ll be in great shape. There are a lot of fantastic beer-drinking cities in the world, and I would begrudge no one for citing Brussels, London or Munich as the best. But one city soars above even these for pure, saturated beery experience: Prague. Leave aside the fact that it’s Prague, one of the world’s most comely ancient cities (and historic)—it’s also one of the most vibrant pub towns and, for Americans, one of the most hidden. We only barely understand its pale lagers, never mind traditional lagers of darker hues or the growing number of ales. Every good beer city has treasures unknowable to the outside world—the beer only locals know, the coolest pubs off the tourist trail, the really authentic expressions of local beer—but Prague’s are legion. This may be a function of geopolitics; when the world was reawakening to good beer, Czechoslovakia was on the wrong side of the iron curtain. We didn’t learn about polotmavé, černé, or lehké. We came to think of pilsner as a beer on the German continuum (wrongly). After the wall fell, we somehow still didn’t learn more, and then, as democracy gained a foothold, failed to notice that imperial stouts, weizenbiers, and eepahs (IPAs) were starting to flow from Czech breweries. It’s impossible to appreciate all these things without visiting the city, which is the good and bad news for Americans. But if you happen to have the good fortune to visit you’ll find one of the easiest cities in the world to navigate, a feast for the eyes and surprisingly cheap travel. And within two days, the scales will have fallen from your eyes and your entire understanding of Czech beer will have blossomed. What follows is a list of pubs and breweries that will fill out your understanding of Prague’s riches. It’s far from canonical (with the possible exception of Zlý Časy)—there are tons of pubs that you could substitute in on your travels (this is a great resource if you are planning a trip), but if you manage just these five, you’ll be in great shape. Visitors to Lokál in Prague can see Pilsner Urquell tankové pivo under glass cases. Photo by Jeff Alworth. This unadorned little restaurant pub has some of the aroma of Communism clinging to it; the space is painted starkly, and runs like a long cellar under an arched ceiling. The reason to go is the beer, which will function as a tuning fork to reset your expectations about Czech beer. 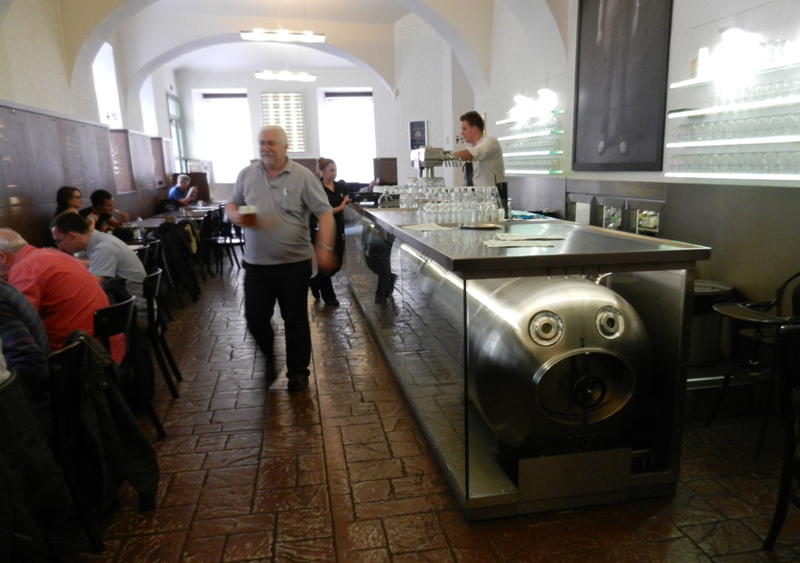 They serve Pilsner Urquell tankové pivo—tank beer—here, and you can see the tanks under glass cases at the front and back. Have a pint of this beer you think you know, but in its naturally carbonated, unpasteurized, ultra-fresh state. It’s not the same beer we get in the States. And look how it’s served: “slice,” “sweet,” or “cream”—another Czech-only feature. Those terms refer to the size of the head. “Cream” means almost all head. (You can see the different presentations at the bottom of this page.) If Pilsner Urquell can taste this different, you immediately begin to grasp that there’s much to learn. 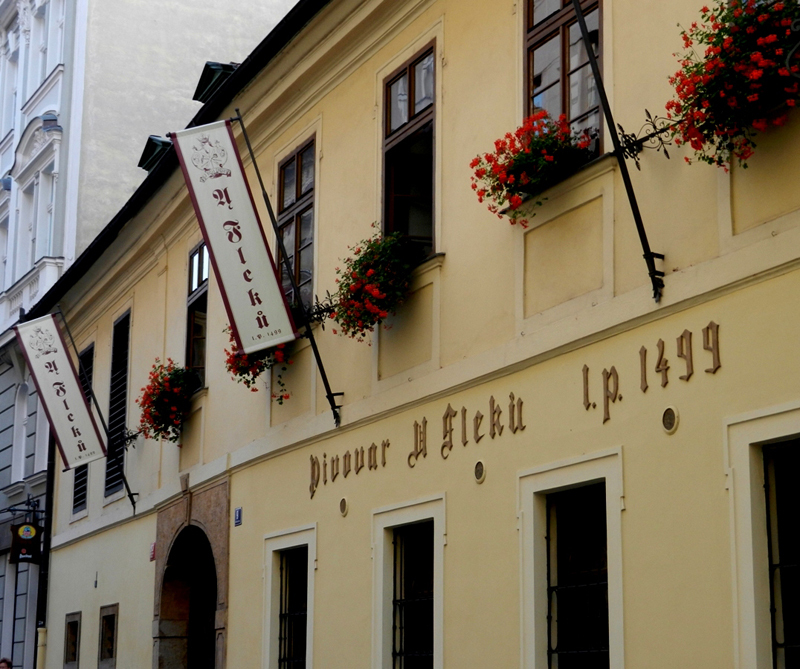 Prague Beer Museum is a perfect place to find beer from the Czech countryside. Photo by Jeff Alworth. This oddly-named pub, which is just across the street and down a few doors from Lokál, is neither a museum nor remotely antiquated. It’s the opposite: if Lokál represents the old Prague, with one beer on tap, then Prague Beer Museum, with 30 beers and a full range of styles, is the future. The space is quite nice—something of a cross between a Belgian café and an English pub. You could spend all day working through the beer list, and I don’t discourage it. But make sure you eventually do take your palate further out on the town. 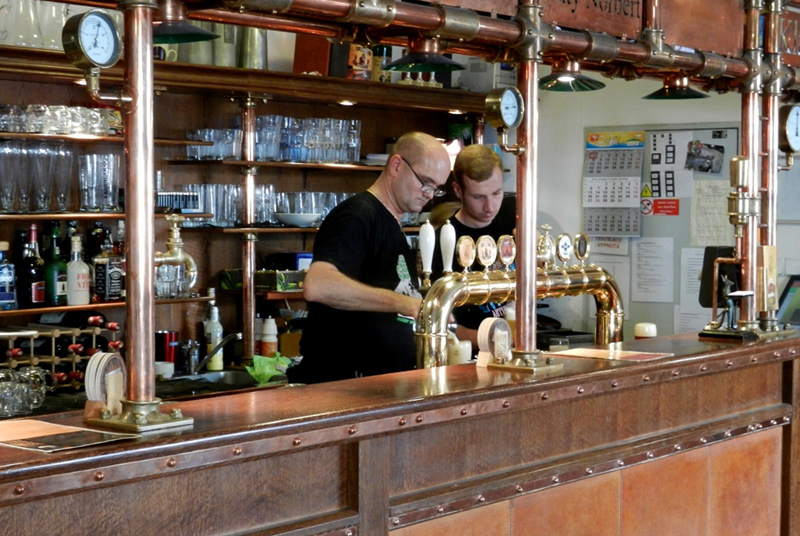 Visit Strahov for its unfiltered (nefiltrované) lagers. Photo by Jeff Alworth. Strahov counts as a pioneer among the new guard of Czech breweries, having been founded a whopping 13 years ago. The Strahov Monastery dates back to the 12th century, and the grounds are peaceful under a leafy canopy. The brewery is not run by monks and in fact looks a lot like an American kit, with the brewery right inside the restaurant. The reason to come, aside from the idyllic setting (definitely sit outside if the weather’s nice) are the unfiltered (nefiltrované) lagers, particularly the polotmavé (amber) and tmavé (dark). Yes, tourists flock to U Fleků and there’s a Disney vibe to the place, but it’s well worth the visit. Photo by Jeff Alworth. U Fleků is the shrine travelers have been visiting for hundreds of years. When tourists make the circuit of Prague’s famous sites, they add U Fleků to the list. Do not, as I did on my first visit to the city, let that dissuade you. It’s true that there’s a definite Disney vibe to the place, including that weird accordionist playing oom-pah songs. But look past the surface and see the buildings, feel the presence of all those past generations of drinkers (they witnessed defenestrations! Well, one anyway.) Tuck into a plate of roast duck and dumplings. And then stop to admire the beer. There’s only one, Flekovský Ležák 13°, a hearty dark lager that dates back nearly as far as Urquell. It’s made on wonderfully old, steampunk equipment that includes a coolship. The recipe was apparently tweaked in the 1970s, but I imagine I can still taste the 19th century when I splash that creamy, frothy beer around my mouth. It is so soft and rounded, cola-and-caramel sweet up front, but then amazes by fading through layers of chocolate and coffee before finally finishing with a dry snap. Ignore the trappings of U Fleků’s tourist-friendly sheen; look and taste the history underneath. The Czech-based writer Max Bahnson once took me to Zlý Časy at the end of a long day when I had already had too much to drink; I may not have acquitted myself with full dignity there. Don’t make the same mistake. Go when your mind and palate are fresh: Zlý Časy is the place Czech beer geeks go to monitor the heartbeat of the country’s evolving scene, and you want your wits about you to experience it. The pub descends down three levels, and each one has a different feel and a different taplist. If you have a choice, you can peruse the beer list before deciding—but because it’s often packed, you may have to wedge in where there’s space. Every city now has a pub like this. It’s where you go to try the hottest beers among beer geeks, where the newest trends first appear, and where the beers with durable credibility pour for regulars. It’s not for tourists—the website is only in Czech. Czechs beer geeks love a good pale lager, but you can understand why they find it old hat. They go to Zlý Časy to discover what’s on the cutting edge. Right now, that means a lot of IPAs. They’re based on the American model, but wander off in a Czech direction. They’re zingy and pale (no caramel malts) and have an aromatic, bready base that comes from those lovely Czech base malts. 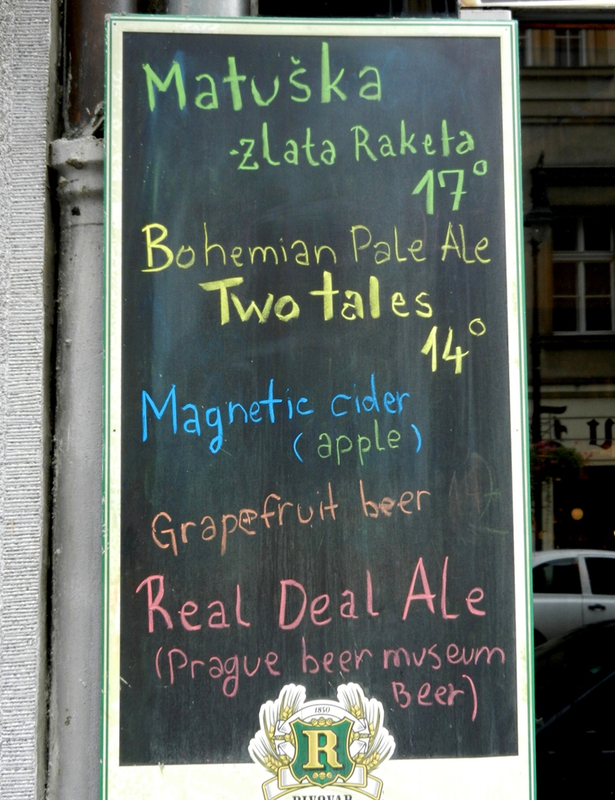 There are a range of ales there that rivals what you find in the United States—all made by Czechs. For many Americans, the real treat in the Czech Republic is lager, made the old way. We can’t get it at home, and I know I just want more ležák, always more ležák. It can be a little disorienting, but it’s fascinating to see this ale trend take off. Zlý Časy is ground zero, so you have to put it on the list. I just want to add another place to go. It is Base Camp Beer Gallery (pifko.info). Nice little pub with 469 types of beer for this moment. All in bottles with different sizes and origin. Zlý Časy actually gets a fairly mixed crowd, and they keep a strong selection of lagers–just checked their website, and they make half of today’s list, and much of the rest is imported beers. With so many taps, there’s always something for everyone. I’m not so sure either if local geeks find pale lager old hat. They still value the smaller and the newer breweries that are able to put out a good Ležák, while at the same time appreciating the diversity we have here now. What this shows how interesting the scene is today. The classic with the modern, the cheap with the expensive, coexisting in peace.